Declarations of love do not get much more highly charged than the one Zhao Xiuxia received from her husband recently on an LED screen bigger than a football pitch. “Dear wife, I adore you. You work so hard for our family. Let’s struggle together for a better life,” scrolled the giant letters on an electronic ceiling above one of Beijing’s glitziest new shopping centres. As well as being a message of devotion, the mobile phone text message — magnified by 5 metre pixels — highlights the dramatic increase in the wattage of China’s economy. The giant 250 metre-long screen at The Place retail centre is one of the most conspicuous symbols of an increasingly affluent and energy-hungry nation, which was said last week to have overtaken the United States as the biggest consumer of energy in the world. According to the respected International Energy Agency, China’s use of coal, oil, wind and other sources of power more than doubled in the past decade to reach the equivalent of 2.26 billion tonnes of oil in 2009, creeping past the US total of 2.17 billion tonnes. This is a major turning point. Energy use is closely related to carbon dioxide emissions, economic expansion and the global balance of power. The US has been the world’s biggest energy user since records began. China has a great deal of ground to make up before it can provide its 1.3bn citizens with a lifestyle comparable to those in the US or Europe. The Chinese government has challenged the figure, but the trend is unmistakable. While most developed nations suffered flat or negative economic — and energy — growth last year, China’s GDP rose by 8.7%, putting it on course to soon overtake Japan as the world’s second biggest economy, and its emissions — already the highest of any nation — increased 9%, while those of most industrialised nations fell. The bulk of China’s energy demand comes from industry and infrastructure, but individual consumption is also rising, albeit from a low base. 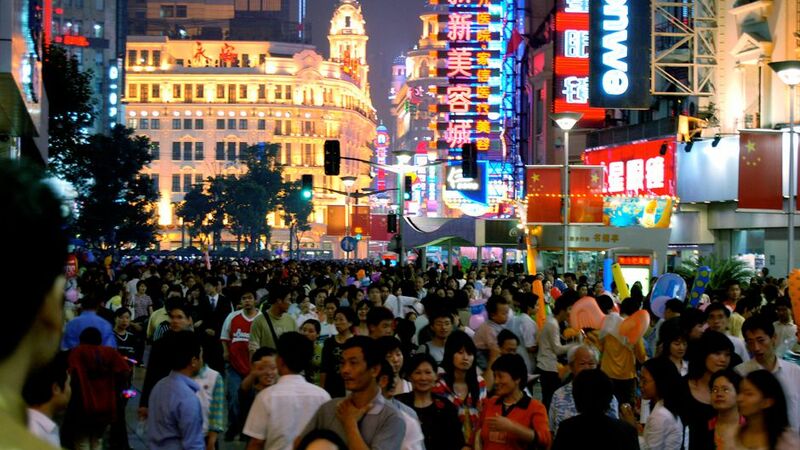 China has a great deal of ground to make up before it can provide its 1.3 billion citizens with a lifestyle comparable to those in the US or Europe. But its people are plugging in more air conditioners, microwave ovens, TV sets and computers than ever before. They are also driving more vehicles. Last year, China surpassed the US as the country that sold the most new cars. Cityscapes are being transformed. Several Beijing skyscrapers have transformed themselves into 30- and 40-storey LED screens in the wake of the ancient capital’s Olympic makeover into a super-modern urban metropolis. The Place, which boasts the biggest single screen display in Asia, is among the most eye-catching and energy intensive. Modelled on a still-bigger screen in Las Vegas and designed by Emmy-winning Hollywood designer Jeremy Railton, it intersperses custom-made films about the stars, undersea creatures and famous landscapes with personal messages, which can cost as little as 1 yuan for a single text message or 20,000 yuan (£1,850) for a dedicated marriage proposal video (more than one suitor has gone on his knees before his girlfriend, while the screen above shows photographs of the couple). Such ostentation is the exception rather than the norm in China, where the average person’s energy use is still only a quarter that in the US. Zhao Xiuxia received her husband’s giant love message while working as a waitress at a nearby juice bar — one of two jobs that together give her a 14-hour working day and a monthly income of just 3,000 yuan (£300) a month. Along with her husband’s salary, this allows the couple — who have recently migrated from a poor farming village in the Hebei countryside — to afford a computer, freezer, air conditioner and motorbike. Their parents have none of these commodities. This man-made beauty has an environmental cost. According to the management company, the screen consumes about 1,500 kW , around 150,000 times that of a 10-watt energy-saving bulb. The government is trying to reduce the impact of this and similar expansions by promoting renewable energy, such as wind, solar and geothermal power. Last week, the state media said China would spend about 5 trillion yuan on clean energy in the next decade and reduce its dependency on coal from 70% to 63% by 2015. Domestic scientists also claimed a breakthrough in the development of a new generation of nuclear power plants. The impact on global markets is increasingly apparent. China’s dependency on imported oil reached 50% for the first time last year and is forecast to rise to 75% by 2030. In recent years, it has also become a major importer of coal from Australia and its nuclear power plans have helped to push the price of uranium to unprecedented highs. China’s dependency on imported oil reached 50% for the first time last year and is forecast to rise to 75% by 2030. The shift to a low-carbon economy is still a work in progress. Across the road from The Place, a new shopping mall is being constructed that aims to pioneer a shift to greener values. Parkview Green, a triangular structure of steel and glass with triple-glazed windows, claims to set a new standard for energy efficiency in Beijing. A spokesman for the project said state-of-the-art technology, materials and design would save a fortune on heating and cooling. It remains to be seen whether the new shopping mall is any more successful in promoting greener, energy-efficient values than its neighbour, The Place. This article was originally published on guardian.co.uk at 12:34 BST on Tuesday 3 August 2010. Max, Thanks for your comment but even with the best intentions it is almost impossible to write about contemporary issues that do not pertain to politics in one way or another. This may be especially so in relation to say climate change or energy where we often find strong political divides on both scale of the problems and on potential solutions. The purpose of Our World 2.0, however, is to try to stimulate a conversation and I would be most interested to learn your views on the energy situation in China and elsewhere. I found this article interesting because it shows how China is trying to cope with the growing energy demand and at the same time searching for ways to de-carbonize economic growth. A problem shared with many other countries. Thanks for your comment Max Shawn. I confess that I believe that the political (from the Greek word for citizen) is everywhere and anywhere and that claiming to be “apolitical” is potentially deceptive and naive. On this article, personally I found it quite balanced and for me it helped to break down some, not all, of the false and simplistic analysis that takes place on China. Sure, China consumes more energy because it is 4 or 5 times greater in population than the US. But surely the per capita levels, and the divisions within China are more important statistics to look? I am interested in finding out what way you felt this was political or unbalanced. How could this article have been written in a less political way?